Under ordinary circumstances, Ben and Mina would never have had reason to speak to each other; he's an easy-going people person with a healthy skepticism about the paranormal, and she's a dangerously obsessive monster-hunter with a crippling fear of betrayal. But the small town of Prospero, California, has no ordinary circumstances to offer. In order to uncover a plot set by the seemingly innocent but definitely shapeshifting monsters-that-look-like-friends-family-and-neighbors, the two stark opposites must both find ways to put aside their differences and learn to trust each other. This totally says sci-fi horror to me, and with a young protagonist, it's clearly YA as well. I love yellow-green eerie lighting, though it gets a little bright at the center of the cover. The title font is pretty neat--definitely not something you see everyday. And I really want to know if the kid (Ben?) is wearing gauntlets. Yep. Need to know that. 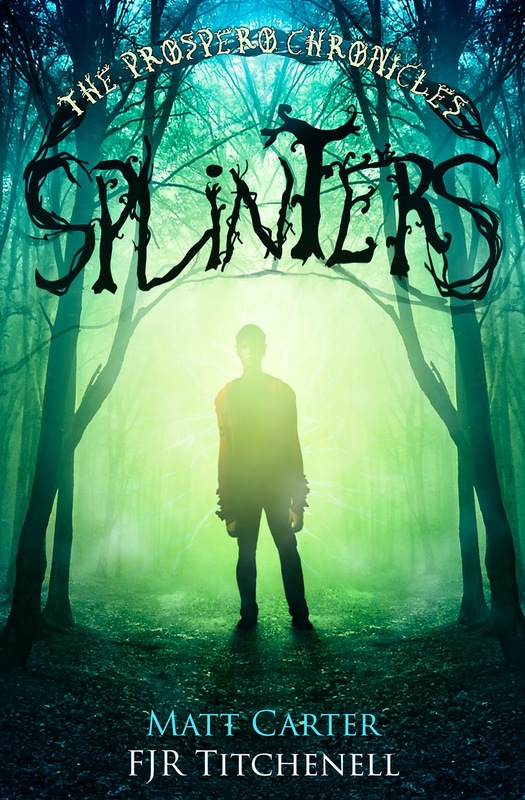 Everyone who adds Splinters to their Goodreads to-read list on or before March 7th will be entered to win a $25 Amazon giftcard. A winner will be selected at random and contacted by Goodreads direct message. So click that pretty button up there and add away! F.J.R. Titchenell and Matt Carter met and fell in love in a musical theatre class at Pasadena City College and have been inseparable ever since. Though they have both dreamed of being writers since a very young age, they both truly hit their stride after they met, bouncing ideas off of one another, forcing each other to strive to be better writers, and mingling Matt's lifelong love of monsters with Fiona's equally disturbing inability to forget the tumult of high school. They were married in 2011 in a ceremony that involved kilts, Star Wars music, and a cake topped by figurines of them fighting a zombified wedding party.